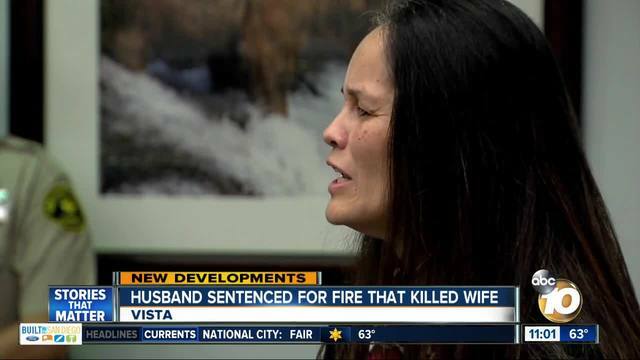 VISTA (CNS) - A man who set fire to his mobile home in Oceanside, killing his 74-year-old wife, was sentenced today to life in prison without the possibility of parole. Andrew Hollis, 65, was convicted of first-degree murder and a special circumstance allegation that arson was the cause of the fire that killed Gertrudes "Diana" Hollis. The victim had limited mobility and was recovering from an October 2014 car crash when the fire broke out on Feb. 22, 2015. The fire started in the living room, on the other side of the wall from the victim's bed, Villaflor told the jury. Neighbors who rushed to the scene found an injured Andrew Hollis outside, and he told them his wife wasn't home, according to the prosecutor. As paramedics were treating the defendant for severe burns, he pointed the finger at his wife's adult son, Conrad Giles. Giles had moved out the day before the fire after an ugly argument with his mother, the prosecutor said.